Home|Articles|Geo-Fencing Vs Geo-Framing…There is a new kid in town! As digital display advertising is continuing to gain momentum with marketers as a more “cost effective” means to reach customers and prospects than traditional methods, it’s good know the differences in approach and how new technologies may improve your Ad Spend! 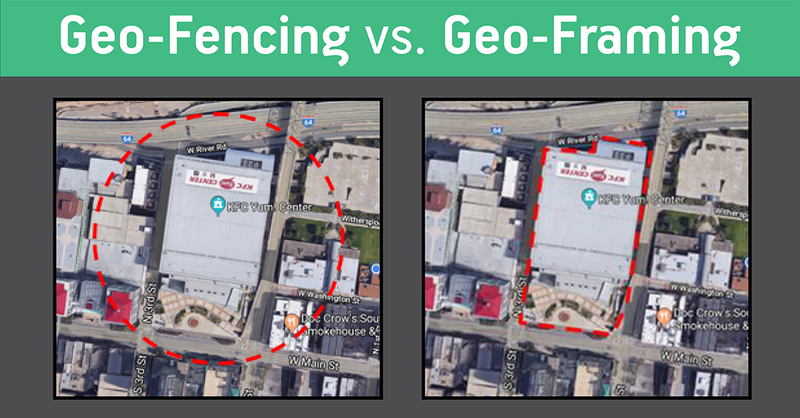 “Geo-Fencing” uses GPS or RFID to create a virtual boundary and requires someone to have location services turned on, to actively opt-in, and it uses cell towers to correlate a location and then serve up ads in real-time to devices “persons” that went into a specific area. “Geo-Framing” requires someone to search the internet (driving an ad call), does not require opt-in, and uses latitude and longitude to target specific areas down to a meter. This technology allows you to serve up ads to the device in real-time, or up to six months in the past, and by matching back to their household IP locations to reach targets while at home. 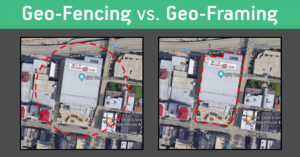 Geo-Framing is a new “cookie free” technology introduced in 2017 that takes Geo-Fencing to a higher level, with the biggest difference in the use of historical data for that geo site. By linking device IDs to household IP addresses, it allows marketers to connect with real people. This approach also helps to eliminate robotic ad fraud with a 95% or greater confidence level. This new “IP level” trend in digital advertising may also be effective to use for your email “opt out” audience as a less invasive option to email deployments. To share a quick example, this tactic was very effective for a professional sports team that targeted previous attendees at their location. Their campaign served 120,000 impressions during a two-week window leading up to the sporting event, in addition to their other promotional efforts. IP targeting generated a 22% lift in ticket sale conversions compared to the non-targeted control group. Game day attendance saw a 68% improvement over their average attendance. Needless to say, “There is a new kid in town”, and Valid is happy to share other impressive case studies to help set up your next digital project! For more information about Valid’s Data Solutions, please contact us or write info@valid.com.